Mario Bava, (Hatchet for the Honeymoon, The Whip and the Body), master of the Italian suspense film, tries his hand at science fiction with this stylishly mod twist on the vampire legend. Two spacecrafts on the same mission land on a strange, misty planet. The crew members each find themselves overcome by a hostile alien force which causes homicidal impulses in each of them. As the astronauts are killed one by one, the dead won't stay dead, which complicates things greatly for the remaining living crew who are attempting to unravel the mystery of the strange forces at hand. 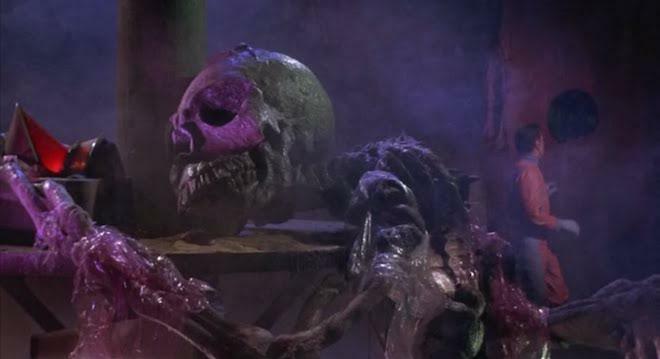 Great set design, pleasingly garish colors, and a genuine sense of dread have made this film a cult favorite. Mario Bava is one of the more prolific Italian horror filmmakers whose work ever graced the big screen. His work is well known among film buffs and critics alike. Even though most of Bava's projects were done on a smaller budget than we might be used to today, they were always a perfect specimen of what every movie should strive for visually. No matter the budget, Bava always added great detail to his sets and was a master cameraman, who framed each shot beautifully. It's no wonder than nearly 35 years after his death, Bava is still talked about and his movies celebrated. One of those films is 'Planet of the Vampires' from 1965. This is not one of his best films by any means, but it might be his most interesting. Don't let the title fool you. There are no vampires in this film. In fact, if I were given the option to name this film, I would call it 'Alien'. And yes, I'm speaking of Ridley Scott's 'Alien' from 1979. If you think about Scott's 'Alien' film, going into 'Planet of the Vampires', your head might explode or your chest burst open at the numerous similarities. 'Planet of the Vampires' was first though. Nearly fifteen years before. But where 'Planet of the Vampires' left off, 'Alien' picked up and added all of the strong characters, the debilitating fear and scares, and one hell of a monster. Yes, 'Alien' is by far a better film, but it's great to see where Ridley Scott and his writers were influenced by their genre bending film 'Alien', whether they admit it or not. The story starts out with two large ships traveling through space on a mission to explore the vastness of outer space. The two ships traveling together receive a distress signal from a strange planet in the distance. The ships travel to the planet to investigate, but as they are landing on this strange planet, the crews become possessed and start to kill each other off. 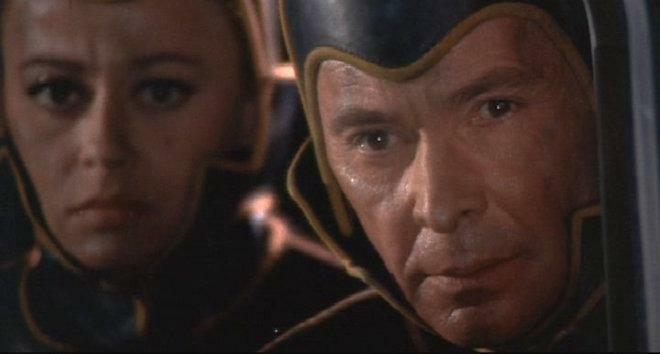 Only Captain Markary (Barry Sullivan) has not been possessed and is able to get his crew back to normal. Both ships crash land on the planet, where Markary and his crew set out to find the other ship. Once they find it, the soon see that the other crew have all killed themselves on the way down. When the Markary and his crew start to bury the deceased, the dead in fact start to get it and cause trouble. This leaves Markary and a few of his surviving crew to try and repair their ship and get off the planet before they too become consumed by this mysterious evil. There is actually a scene here where Markary and his crew discover another ship on this alien planet where they see large skeletal remains of some big alien life form. All of this was done in 'Alien', but only better. The film mostly consists of Markary and his remaining crew, searching and figuring out a way to survive, with almost no real action up until the end. And even then, it isn't all that spectacular. But really drives this movie home is the intricate and amazing sets, practical effects, makeup, and costumes. Every little detail is paid attention to by Bava, and shows up nicely in each frame. But the story line isn't all that thrilling and the pacing is quite slow. 'Planet of the Vampires' is visually stunning from start to finish, but it's story execution is lacking. Luckily a great mind in Ridley Scott was influenced enough to make this movie into something more. 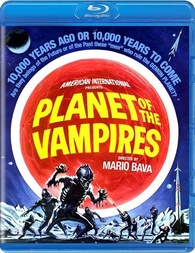 'Planet of the Vampires' comes with an impressive 1080p HD transfer presented in 1.85:1 aspect ratio. This film came out 50 years ago, and it's never looked better. I was shocked on how amazing this video presentation looked. Everything looks clear and fixed, all the while keeping that nostalgic mid 60s grain and look in tact. This is how all films of this caliber should look from this time period. Detail is quite sharp, given the circumstances here. Closeups reveal the fun makeup effects from the mid 60s as well as the excellent textures in the space suits and the odd surroundings of the alien world. You'll be able to make out fine intricacies in each of the frames. Colors pop off screen and are superbly saturated. Reds, blues, greens, and yellows pop nicely throughout. The skin tones are very natural and the black levels are deep and inky consistently. There were a few spots where some debris or marks showed up on the print, but it's nothing to write home about and I think it just adds to the character of the film. Other than that, there were no major issues of concern here, leaving this video presentation with top marks. This release comes with a great lossless DTS-HD 2.0 audio mix. This stereo mix is surprisingly engaging and full. The dialogue of course is dubbed, which adds the laughable element, but it never shrills or shrieks, nor is it too soft. It is well balanced and easy to follow. The ambient noises and sound effects are excellent here. They are robust and loud, almost immersing you into this alien world. The excellent score always adds to the tone of the film and never drowns out any dialogue or sound effects. I did notice where the sound got very soft then very loud in a few moments, but it seemed to naturally fix itself. Other than that unfortunate business, there were no real issues of concern, leaving this audio presentation with great marks. Audio Commentary - Mario Bava's biographer Tim Lucas delivers the audio commentary track as he discusses Bava's life and career and his work on this particular film. It's a good listen. Trailers From Hell (HD, 7 Mins.) - Joe Dante and Josh Olson discuss Bava's film here over the original theatrical trailer. Quite fun to hear from these guys. Theatrical Trailer (HD, 3 Mins.) - Trailer for the film. Alternate Music Score Highlights (SD, 21 Mins.) - Here is an alternate take at different music cues at some of the bigger music moments in the film, which was taken from the old VHS version. 'Night of the Id': Original Short Story - 37 pages of text on screen of the original short story that the film was based on. Original Italian Opening Credit (HD, 3 Mins.) - Original opening credit sequence in Italian with the first shot of the film missing. Still Gallery - There are over 40 images here from production photos, to promo pictures. 'Planet of the Vampires' doesn't necessarily pack any real scares or screams, but Mario Bava's attention to detail and strategic story telling is legendary. He knows his way behind the camera and what looks beautiful and excellent on film. There's not one shot that isn't thoroughly thought out and planned. And that's why his film, including this one is worth watching. The video and audio presentations are both amazing and the extras are fun. If you're a fan of horror or Bava, then I highly recommend this.